As we continue along our journey of vacation eats, we come along a good ol’ burger bar. While researching our meals, I ran across a ton of great reviews about this fairly new restaurant. While we are totally Five Guys fans, we do believe that you can come along some other good burgers. And the key is, simply don’t compare them to Five Guys. Because, easily stated, there is no comparison. I am happy to report that DMK Burger Bar, located in Lombard, serves up some Good Ol’ Tasty Grub. After spending our day all around Downtown Chicago, we were hungry and ready to eat. We left Downtown and drove the 30 or so minutes to DMK. I selected the Lombard location due to the close proximity to our hotel. I called on the way and did call ahead yet, arriving at about 6:10pm, we had no problem getting a seat. We were seated inside and greeted with one of the best waitresses we have ever had. While the menu consists mainly of burgers, there are many varieties and options available. Our waitress walked us through the entire menu, in stellar fashion, pointing out not only her favorites, but also what the restaurant is most known for. I pretty much knew what I was getting when I arrived. At first, I was going to get a Veggie Burger but, Mommy decided that is what she would be getting. In order for us to be able to try both, I ordered a regular burger. We opted for no appetizers yet our waitress brought us one on the house. 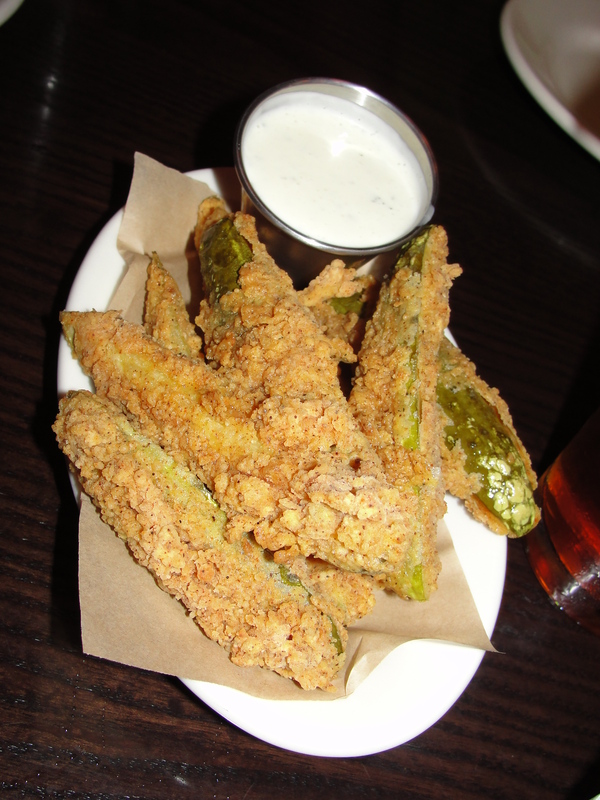 The Fried Okra & Dill Pickles was served to us with a Herb Ranch dressing. I wasn’t sure how I would feel about this appetizer, but went ahead and tried it anyways. I ended up really enjoying both the okra and pickle pieces. All of the pieces were lightly battered and just fried – they were just on the verge of being crispy. This allowed the interior to be soft & moist and play well with the exterior. Mixed with the ranch, this was a tasty snack. While I don’t think I would have paid for this item, I am glad I got to try some for free. In addition to the burgers, I was pretty psyched about trying the fries. We got 3 small orders of 3 different types of fries. Let us begin with the basics – Sea Salt & Black Pepper served with House Ketchup. Even though these were the most basic of the fries, they were great. The fries themselves were hand-cut and all varied in size. They were cooked up good and long to the point of crisp. These were not overdone but probably about 30 seconds from being there. 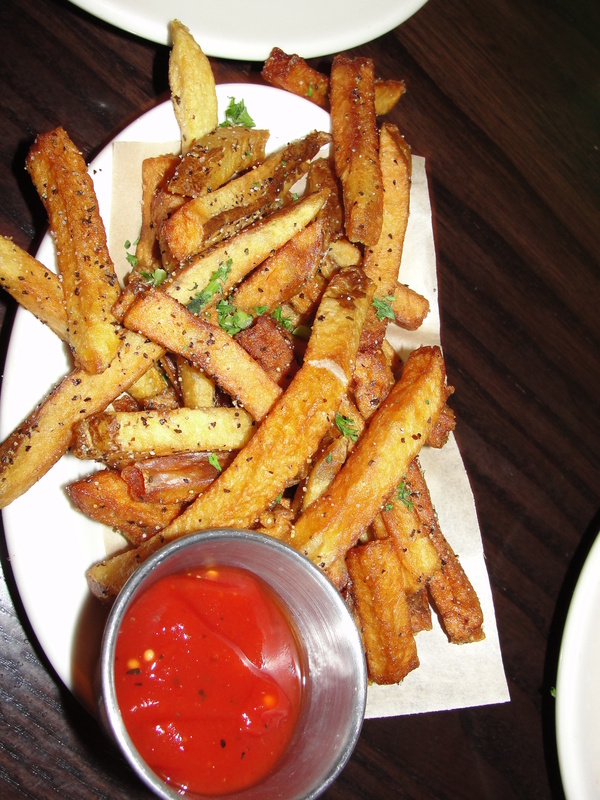 The salt and pepper provided texture to the fries along with all the flavor you would need. When dipped into the ketchup, the flavor was only increased. The ketchup was thin and I could taste red pepper flakes from within it. Rather then make the ketchup spicy, DMK added enough flavor to it to really call it their own. I had the least amount of these fries but, would certainly get them again. 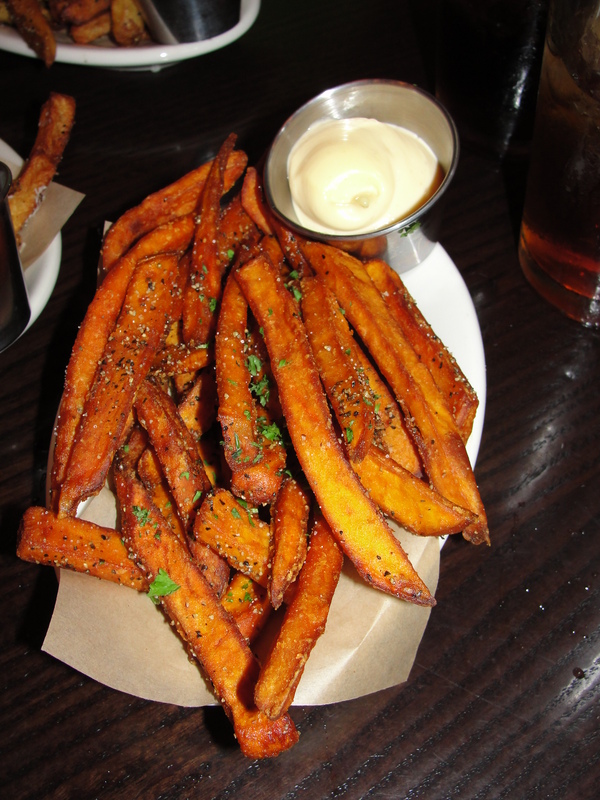 Next up, let’s chat about the Sweet Potato Fries served with Lemon Tobasaco Aioli. The fries themselves were good and semi-crispy-semi-moist. To me, this is exactly how Sweet Potato Fries should be. I was somewhat disappointed with the base flavor of these fries. While they did have some of the sweet potato flavor, they were missing the pizzaz of really good sweet potato fries. Don’t get me wrong – these were good – just not the best I have ever had. As for that Lemon Tobasaco Aioli…where do I even begin. The consistency was similar to mayo yet the flavors were so baffling. The Aioli was not at all spicy and rather than lemon, I could taste blueberry. I didn’t care for the aioli on its own but boy, dip those sweet potato fries in there, and all the flavors combined in my mouth and went Ka-Pow. DMK certainly knew what they were doing when they created this combo. 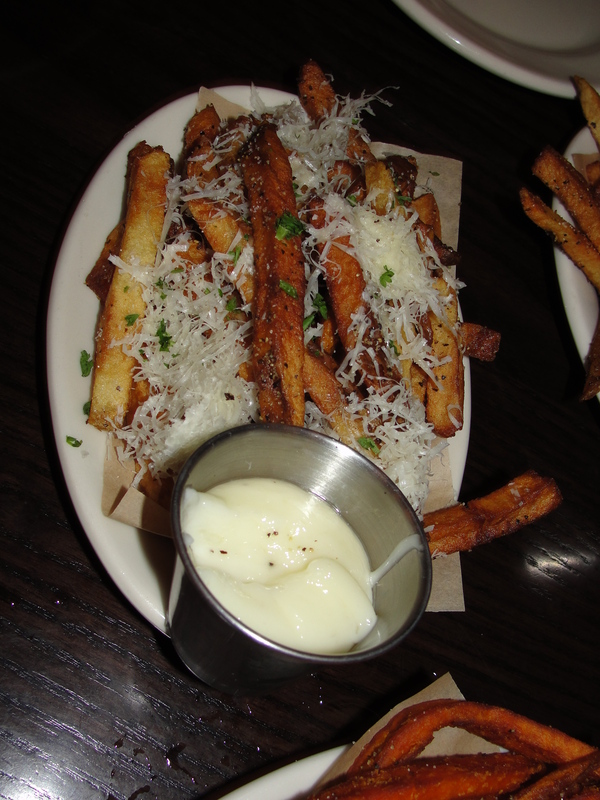 Last but certainly not least, are the Parmesan Fries with Truffle Cream. The fries themselves were normal fries with a heavy coating of parmesan cheese. By far, the star part of these fries was the Truffle Cream. I absolutely loved this stuff. The flavors were so complex yet seemingly so simple. I found the texture to be beyond smooth & thick yet, some how also very thin. Eating the truffle cream on its own, was almost too much for my palate to handle. When I added the fries to the truffle cream, I was brought over that line into Foodie Ecstasy. Oh. My. Gosh. Is really the best way I can explain the combination of these flavors. Perfect. Delicious. Good Ol’ Tasty Grub. As if the fries were not enough, we got burgers too! I ate about a quarter of Mommy’s Veggie Burger and I really enjoyed it. House Made Veggie Burger Patty topped with Aged Cheddar, Eggplant, Tomato and Pesto Mayo – this veggie burger was for real. Plus, this sucker was huge. 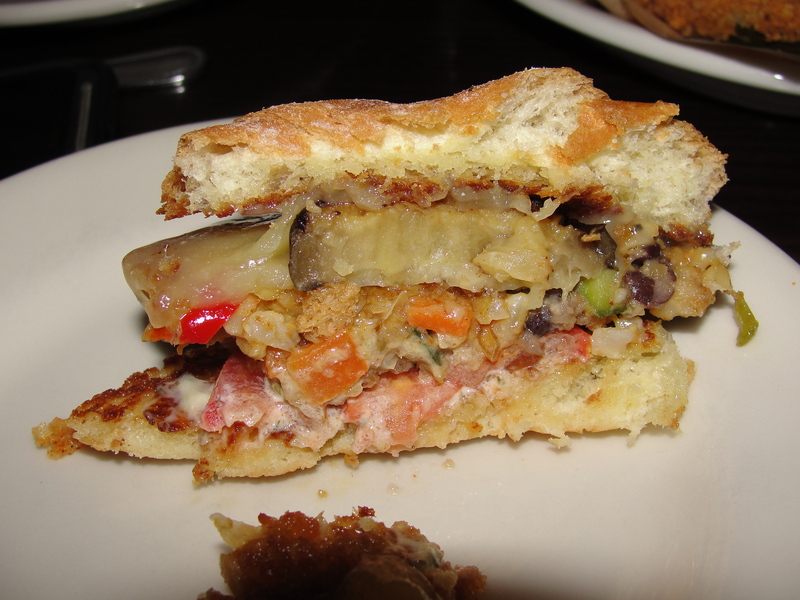 The veggie burger itself was so nutty & grainy and had no odd consistency. By far, the pesto mayo was the ingredient that played the biggest part. It was similar to a humus in consistency and had a little bit of a kick to it. I totally loved this Veggie Burger and would get it again in a heartbeat. 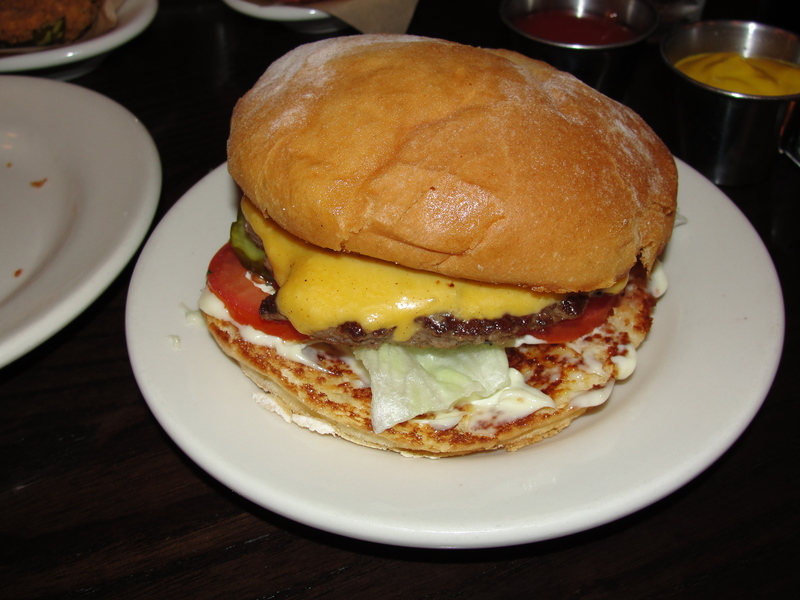 I ordered a regular burger – all grass-fed & patties made daily in store. To top mine, I went with American Cheese, Lettuce, Tomato, Pickles and Mayo. I also added my mixture of ketchup & mustard to it. Starting off, the bun was great. Very soft and somewhat buttery, it held all my toppings together. 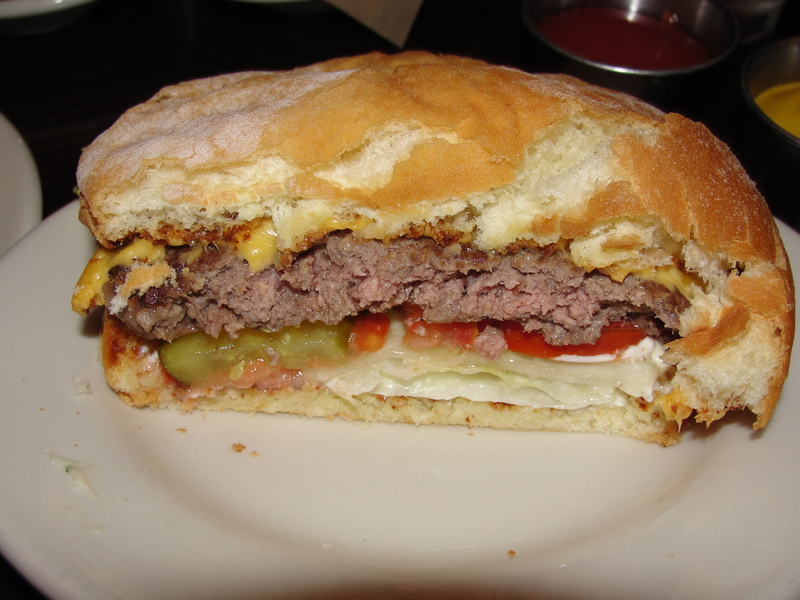 The burger itself was super juicy and not overly seasoned – a plus in my book. The patty tasted super fresh as did all the toppings. Mixed together, every bite provided my mouth with an assortment of textures & flavors that mixed just perfectly. Then, I added the ketchup & mustard mixture and was brought to great burger bliss. 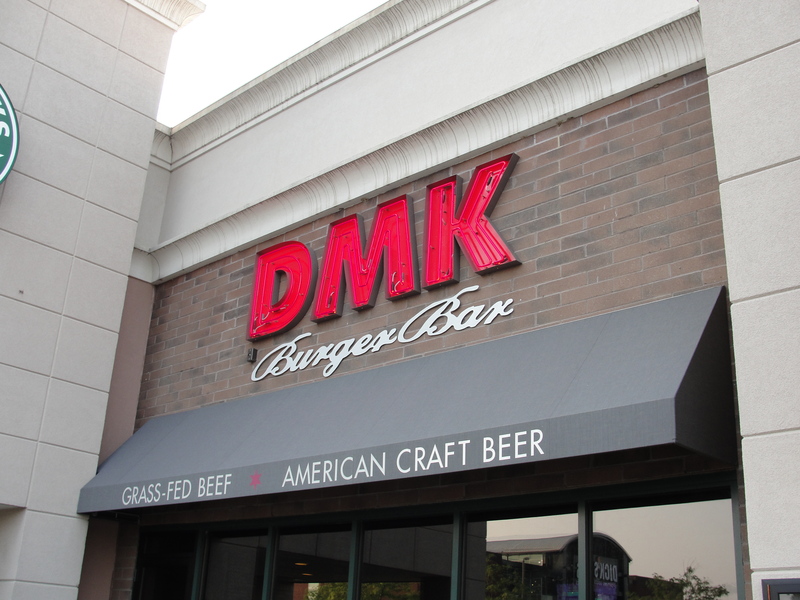 Even if the food wasn’t that great, the service at DMK Burger Bar was great enough to go back over and over. Lucky for us, the food was pretty killer too. Fabulous fries (and lots of them) along with good burgers won my heart at DMK. The atmosphere was basic, simple and very cozy. Chances are, I won’t be in Chicago again for quite some time. But, mark my word, next time I am there, I will be visiting DMK again. This tasty little suburban location is sure to provide you with some Good Ol’ Tasty Grub.